It was Debra’s idea to meet in Bologna. Debra Kolkka is a (lucky) Australian, who lives part of the year in Bagni di Lucca, a Tuscan commune near Lucca, and writes a delightful blog named – no prizes for guessing – Bagni di Lucca and Beyond! Do hop over and take a look if you are a fan of anything Italian. I had all but finalised Venice for my solo trip last month, and Debra’s comment on my post stating “Come to Italy”, kind of sealed it.. That, and the chance to meet a blogger friend in the flesh for the very first time. And so I hopped on a train from the estación Santa Lucia in Venice, one overcast day, and awaited her arrival under the Fountain of Neptune in the heart of the gorgeous medieval town. It did not take long for Debra and her charming husband Jim, to locate the lone Indian under that fountain, and our online friendship transitioned to the ‘realness’ of a face to face meeting without missing a beat. And without the slightest hint of awkwardness! I had somehow expected to sit around and chat over lunch, and had considered enrolling for a city walk late afternoon. I was also most ill prepared for the weather in my leather loafers and thin sweater. I should have known however that Debra isn’t the kind to sit around idly, and sure enough, after a brief pit stop for delicious sandwiches, she decided she would show me around her favourite parts of town, come hell or high water! In the event, we couldn’t have chosen a better destination for a rainy day. Bologna, with its long (40km!) stretches of beautiful porticos, provided very aesthetic shelter from drippy weather and we managed to fit in a remarkable amount of sightseeing in our short time there. Just off the Piazza Nettuno, is the Biblioteca Sala de Borsa, the old stock exchange where the foundations of the old city are showcased under a glass floor. It is now a library and a meeting place and exhibition center. 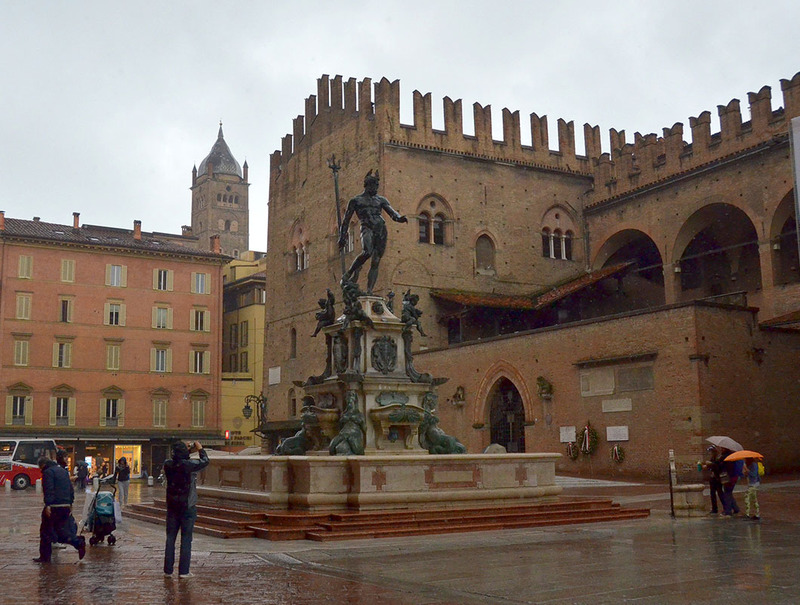 The Piazza Maggiore nearby, awash in ochre and rust palettes is flanked by imposing palazzos housing the Town Hall and other government offices and the lofty Basilica of San Petronio. A short way South of the Piazza was the Palazzo dell’Archiginnasio, once the university of Bologna, claiming to be the oldest in the Western hemisphere. It is now the municipal library and its most fascinating features are the grand staircases and reading room encrusted with commemorative inscriptions and colourful coats of arms, and the ornate wood paneled anatomical theater where medical students once performed autopsies. The latter sustained severe damage during World War II, but is supposed to have been faithfully restored to its original state based on old drawings. The quadrilatero or market street is foodie heaven. This apparently is the place to return to later in the day – in better weather no doubt – when market stalls give way to bars and restaurants. It would have been lovely to have had the time to linger over a happy hour Spritz here. Our last stop was the Basilica Santa Stefano, also known as Le Sette Chiese (the seven churches) across the beautiful Piazza of the same name…..a fascinating cluster of buildings of varying styles and periods, apparently built over an ancient temple to Isis! The XII century Romanesque complex is considered closest to the original of several existing copies of the Church of the Holy Sepulcher (the 1028 Byzantine restoration) in Jerusalem! 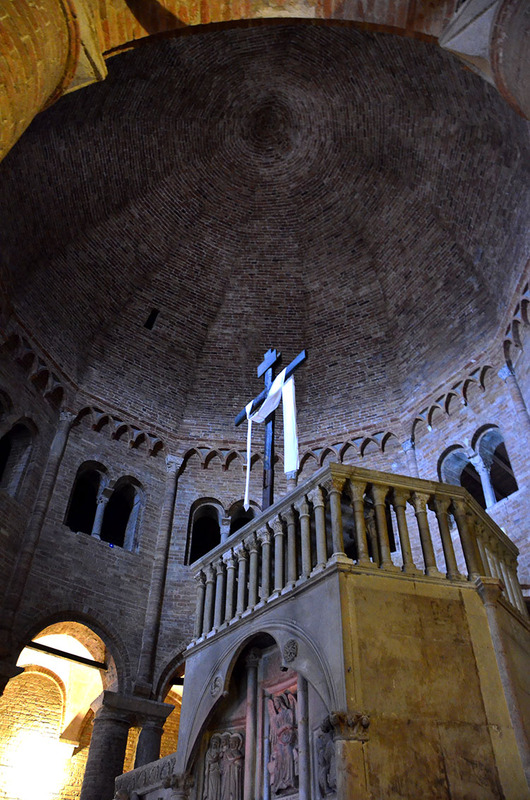 A copy of Christ’s tomb in the temple inside, held the remains of Saint Petronius, the patron saint of Bologna, until they were moved to the basilica on Piazza Maggiore. It was a good thing we hit the ground running, for the weather deteriorated rapidly towards evening, and I decided to return after a hurried goodbye. Venice appeared to have fared worse from the inundated plaza outside the station. A couple of tourists on the vaporetto wearing the ghastly orange and green plastic shoe covers (probably left over from the last Acqua Alta) smiled smugly at the wet shoes around.. I giggled at the thought of Debra’s reaction, if I had arrived sporting a pair! By the time I tumbled out of the vaporetto and raced ‘home’ I was cold and drained. I had snacked on the train, so dinner that night was a bar of duty free chocolate (I am never without a store of chocolate) and some salted pistachios, along with a fragrant pot of coffee that the night receptionist very kindly brewed for me. The day after was gloriously sunny across the region and I wished I had thought of staying overnight, to sample some of Bologna’s famous cuisine. But I was happy I managed those few enjoyable hours with my lovely friend and her husband. Thank you Debra and Jim. I look forward to meeting you again someday…..in Italy or Australia or who knows, perhaps even in blistering hot Chennai. Just make sure you don’t arrive in November, for walking in the rain here is not quite the same as in beautiful Bologna. Pretty place, a wonderful new friend. All’s perfect. 🙂 Have a great time, Madhu. Your pictures and essays are beautiful and informative as always. As exotic as Bologna can be to a yearning desi, your travelogue is a well-crafted treat. Exquisite slideshow too! No it won’t! 🙂 It was a fun day despite the weather all thanks to Debra. I know Debra but haven’t visited hers for ages so I must put that right. Thank you Jo. I guess they are alright, but light wasn’t my friend on this trip. I do remember Kat and Suzanne’s beautiful posts on Bologna. What a wonderful city that I haven’t visited. Italy is simply one long museum with so many places to see! Debra’s blog is wonderful, and I love Bagni di Lucca … the setting is every bit as spectacular as she makes it out to be. Someday I will meet her and Jim there! Totally agree with you Frank, Italy is one big museum. I can’t wait to rediscover it. Simply so much to see and appreciate … and I hope to return within the next 3 years. Delightful shots! Sometimes it’s a blessing to be open for challenges! Meeting a friend is always a joy. Great coverage & nicely worded. The local flavor is quite interesting. Thank you for sharing. how thrilling to meet a blogger friend, and an Aussie … as you know I am about to meet Marianne and Gilly, within a few days of each other … very exciting … thanks for a wonderful post on those hours in Bologna! Lucky you! Look forward to reading all about it Christine. It was great fun to meet you in Bologna. The day could have been better, but it didn’t really matter. I have been to Chennai and would happily return, especially now. Who knows were we wil meet again? Ps: Yikes, I spelt your name wrong…editing right away! It really is an act of faith to meet with someone you have known only online and through blogging. I’m so glad you had a fun time, and it must have been a nice change of pace to have someone you knew to tour the city with. I have only met a fellow blogger once, and that is Roy McCarthy from Jersey, who was a incredibly warm and welcoming host. Great photos, and I loved to read about your meeting and your day, Madhu. It is, but it somehow feels like I know everyone of my online friends – you included – on a personal level! Thank you Naomi. Great photo of Chiesa San Sepulchro, Madhu. Thank you Paula. It was such a lovely ancient structure. Hi Madhu 🙂 Will you be posting more photos from your trip to Italy? Did your daughter and her family go to Croatia as planned? What are their impressions? Don’t hesitate to tell me even if they weren’t good …. like Venezia, dear Madhu… next time let me know when you travel to Italy, since Switzerland is just around the corner! I certainly shall. I am hoping to return to Italy with hubby, hopefully next year….fingers crossed 🙂 Thank you Claudine. You have had quite an adventure, Madhu – a beautiful one! As is your company on the journey Marina 🙂 Happy June to you too. A beautiful post, Madhu. The slideshow ist excellent! Fairly typical of the cities of Europe. There is a certain charm about their buildings and cobble stone streets in many towns. You have captured the spirit of Europe here. Thank you Ian. I am glad i got a few decent shots in the morning, before the rain came down in earnest. Nice series from this town that I think is very interesting. Thank you Bente. 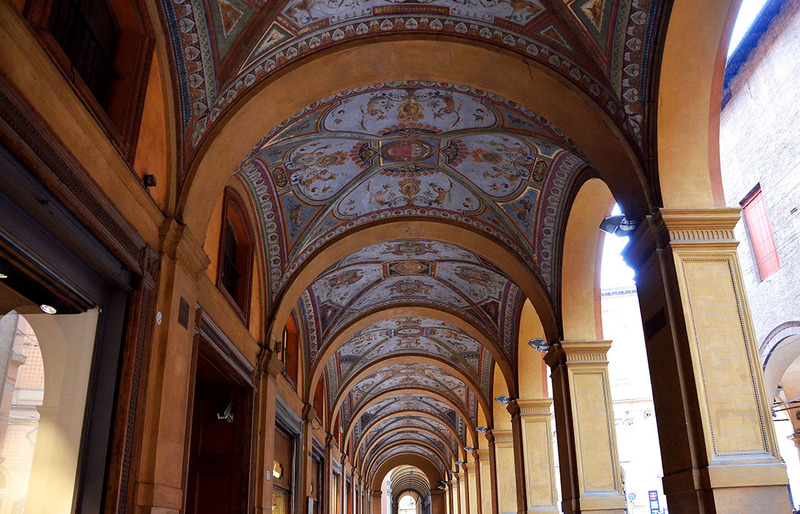 Bologna really is worth more time than people allow in typical itineraries. Bologna was on my list of must sees and this just makes me want to go even sooner! Great post & pics! So much information conveyed in such a gorgeous package! The photos are wonderful. I’ve never been to Bologna and your post is a real treat, giving such a good feel for it. P.S. Nice to know you are such a centered, grounded person (never being without your stash of chocolates). YES. Ha, a kindred spirit!! 😀 Thank you Judith. I had read about bologna earlier in a travel book… this place is so beautiful… there are so many lil towns that we dont know about… lovelyy pictures and grt write up as always..
Another set of fabulous photos and trip adventure! Love it all! That’s so lovely, to meet blogger friends in the flesh. Happy for you, Debra and Jim. You’ve not visited Singapore?! Now, we need to fix that – and I look forward to meeting you here. USA too? (Shaking my head in amused disbelief). This place is so incredibly beautiful isn’t it? Rain-drenched on top of it – how utterly romantic! They really are Joshi. Every inch covered with family crests! I agree. Thank you for your visit and comment Slunicko. Wow, meeting blogging-friends in real life is great! Glad you jumped at the opportunity. Seems like you had a fun time! What a delight! Touring a city with a ‘new’ friend, I have met a few of my blogger friends over the years and am never disappointed in finding them as special in the real world as they are in the blogesphere. The slideshow and the city tour, once again you urge me on to put on my travel shoes. I am so happy I can steal away with you. I was happy to have made a start with Debra. Thank you Valentine. Argh! No fair. 😀 I would love to meet Debra. I wonder if it’s through my blog that you two connected… Hmmm.. 😉 But I wont be surprise that if that wasn’t the case. Two of the best travel blogs, you and Debra are just meant to meet both in blogosphere and in person. Bologna is lucky to have two of you. I’m surprised it didn’t collapsed. Ahihihi 😀 A lot of things in the slideshow is interesting too. Very funny!! 😉 I forget how I connected with Debra, could very well have been through your blog. Thanks Rommel. I think it was through your blog Rommel…thank you for that. Very interesting! Loved the photos too. I too went on a day trip to Bologna once – it was raining so we took cover under the miles of portici. Sadly there was not enough time to visit the Basilica Santo Stefano or the old university… it seems like I missed all the best bits! Madhu, I must add that you are one of the travel bloggers I most want to meet. Perhaps next year in Chennai, who knows? How lovely to meet Debra in Italy. One can only keep their chin up for so long in a day of cold rain. Traveling does have a few “downs” but as you’ve written about over the years…mostly “ups.” Beautiful post Madhu! Bologna è una delle più belle città italiane, è poco distante da dove vivo (solo 180 km) eppure in tanti anni al massimo nelle sue strade ho trascorso un paio d’ore, avere le cose belle a portata di mano fa rinviare i viaggi. How wonderful to connect with someone who knows her way around. Lovely photos, Madhu. My mother is drooling over these pictures. Italy is her dream destination. Hopefully we’ll go next year. I love hearing about you meeting your blogger friend in “real life,” Madhu! Oh Madhu, you wouldn’t want to travel through Bologna my way. Now that I had a second look at this post I can see how much I have missed :D. These are gorgeous, really gorgeous, and I realised i prefer rain to crowds 🙂 Thank you. 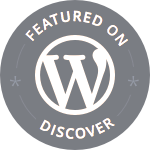 Going through your blog at leisure, I want to thank you for “putting” Bologna on my map. I had a 25 year reunion scheduled with old mountaineering friends in Lecco, and told my wife why don’t we spend the week before in Italy. We added Bologna to the trip, based on your blog. 🙂 And lovely it was. So… Merci, grazie, thank you!